Your purchase will be placed into one of our custom gift boxes. 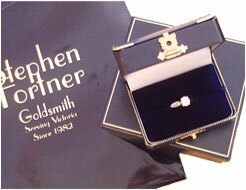 We believe our jewellery should be presented in the very best way. We will ship your item to you at no charge in Canada or the United States. This free charge only applies to UPS Standard Ground. This service has a delivery time to most places in North America of five days more or less...depending on your exact location. If you require it sooner, you can contact us, and we will provide an estimate to get it to you overnight if possible. We reserve the right to select the carrier. All items will have a tracking number that will be supplied to you. Items will be insured while in transit to your location. Purchased items will be sent out within 2 business days once funds have arrived in merchant's account. All international buyers, please check with your customs for duties that may be charged when the jewellery item enters your country. All necessary taxes will be charged and collected. We will not ship to an address other than the confirmed address of the credit card holder.